Starring: Matthew McConaughey, Tye Sheridan, Jacob Lofland, Sam Shepard, Ray McKinnon, Reese Witherspoon, Sarah Paulson, Michael Shannon, Joe Don Baker, Paul Sparks, Bonnie Sturdivant. After such brave and exemplary displays in “Killer Joe” and “The Paperboy“, Matthew McConaughey has completely turned his failing career around. He seems to have left his rom-com days behind him and cemented his reputation as a serious leading actor. “Mud“; the long awaited follow up of the award winning “Take Shelter” from promising director Jeff Nichols, is even further proof of McConaughey’s commitment and keen eye for an intriguing character. Ellis (Tye Sheridan) and Neckbone (Jacob Lofland) are a couple of kids who roam the backwaters of their local area. 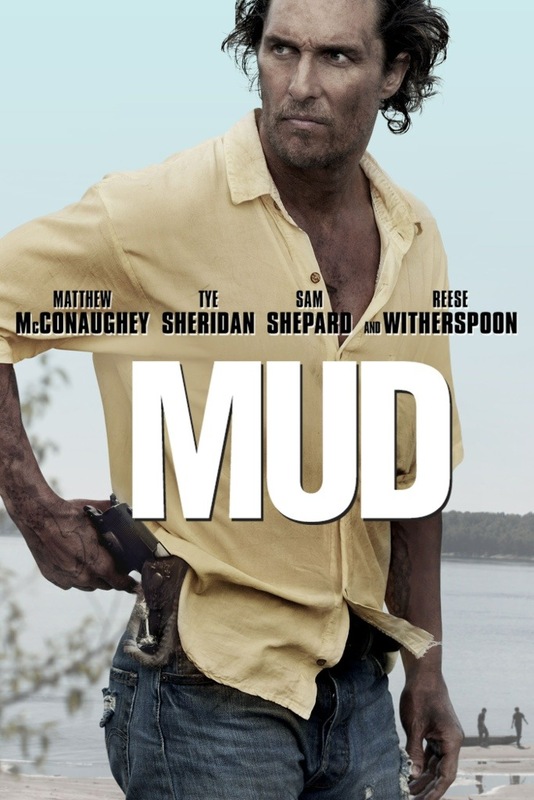 They soon stumble upon Mud (McConaughey), a known fugitive hiding on an island. They are drawn to him and his story of reuniting with his girlfriend Juniper (Reese Witherspoon) and decide to help him escape from the authorities and a gang of bounty hunters, to meet with her again. Following on from his debut “Shotgun Stories“, Nichols takes us back to his home state of Arkansas for another slice-of-life and coming-of-age yarn. It has been compared to the likes of “Stand By Me” and more accurately, the works of novelist Mark Twain and his “Adventures of Huckleberry Finn” in our young protagonist’s exploration of the colourful people and places along the Mississippi River. These comparisons are entirely understandable but Nichols doesn’t merely tread old water, he delivers a competent mood piece with three dimensional characters that are entirely fleshed out and convincing. The two young leads, in newcomer Jacob Lofland and especially Tye Sheridan (“The Tree of Life“) are absolutely outstanding in their natural deliveries of impressionable teenagers and there is solid support from the likes of Ray McKinnon, Sam Shepard and an understated Reese Witherspoon. Regular Nichols collaborator, Michael Shannon is really the only one who doesn’t get much to work with, but that was due to time constraints as he had already committed to “Man of Steel“. The real draw here, though, is a snarling and haunted McConaughey. It’s yet another performance of a very high caliber as he perfectly embodies a man with emotional strength yet an almost crippling vulnerability and naivety. This multilayered attention is afforded to the rest of the film’s script and almost all of it’s characters have their differing approaches and struggles with relationships and the environment they inhabit. Nichols operates at a leisurely pace and is in no rush to tell his story. This is entirely suited for his material with the only major issues being that it, ever so slightly, overstays it’s welcome and descends into formula in the final third. That being said, the characters and the environment (captured by cinematographer Adam Stone) are so rich and involving that it’s flaws are easy to forgive. What first strikes you as an engaging adventure tale soon becomes an emotional and intelligent fable that ruminates on love and loss. It massages both the heart and the head and confirms that Jeff Nichols and Matthew McConaughey are playing at the top of their game right now. We’ll be seeing much more of young Sheridan in the near future too. This entry was posted on August 30, 2013 at 12:14 pm and is filed under Drama with tags 2013. You can follow any responses to this entry through the RSS 2.0 feed. You can leave a response, or trackback from your own site. It is good, man. I know a lot of people who rated it even higher than me but I found just a few little flaws that prevented it from being the masterpiece that some claim. Still, it was top drawer stuff. I enjoyed it a lot. So glad you liked it too. I lived “Mud”. It’s still my favorite film of the year so far. You nail so many of the things that I loved. Great, great review. I really enjoyed it, man. Great little film. I found some minor flaws as it drew to a close but not enough to spoil the overall experience. It would make my top ten of the year for sure. Might even get in amongst the top five. I’ve never actually seen any of that but I think “Killer Joe” and “Lone Star” are two of his best. I also thought he was superb in “Dazed and Confused”. Easily my favourite film of the year thus far. McConaughey can do no wrong at the moment. Great review :). Shows what can happen when you have a great cast, and give them material that’s worth their time and effort. Good review Mark. Absolutely Dan. It certainly looks like the cast know they have good stuff and commit themselves accordingly. Very good film. Terrific review. I’m glad that McConaughey is finally making the films he should have been making all these years. Cheers man! Couldn’t agree more. I always had faith in McConaughey’s abilities after really enjoying him in earlier roles like Dazed and Confused and Lone Star but he went completely off the rails with his choices. It’s superb to see him realise his abilities now. Thanks Chris. It certainly is amongst the best of the year so far. I’m really enjoying McConaughey’s output these days. It’s great to see Nichols continuing his solid work as well. Cheers Adam! That’s 3 for 3 for Nichols now. I’ve enjoyed all of his films and it will most certainly be interesting to see what he pulls out the bag next. The same could be said of McConaughey as well. I’m really enjoying his performances these days. Glad you liked the film, Mark. It’s one of my favorite of the year and a beautiful reminder that we are demanding more character driven stories than mega blockbusters. Glad you mention/touch upon everyone in the cast because they all do a phenomenal job. Also, I have to admit, I never even thought of the similarities with Huck Finn. I’m a terrible person. Thanks Nick. Well mentioned on the more character driven demands from the audience. That’s spot on, man, and long may it continue. Great work buddy. One if my favourites of the year so far. Cheers mark. I hold it very highly as well, man. Great movie, filled with superb performances. Excellent review Mark, I absolutely loved the intimacy of the setting and the characters in this film, and forgive me for going out on a limb here but I thought Reese Witherspoon was a nice touch as well. She may not have had a meaty role, but she was good playing a down-and-out, kind of rough type of girl. that was a nice change as well, on top of everything else that was firing on all cylinders. thanks for bringing me back to this. Thanks for dropping in Tom. And, yeah, I absolutely agree about Witherspoon. She’s one of my least favourite actresses but I have to put my hands up and admit that she was rather good here. Couldn’t quite get over McConaughey, though. The man’s on fire just now. Great film and great performances across the board. I do wish Shannon had a little more to do, though. Yeah, really. . . because I sure don’t remember much of what he did. that’s crazy. also, attributable to the powerful performance put on by McConaughey. Mud was the movie that pretty much won me over with him honestly. great stuff. can’t wait to see what he’s gonna be like in Wolf of Wall Street! Yeah, Shannon’s time constraints were the reasons for his lack of a substantial role here but like you say, McConaughey is the real reason to see this. Really enjoying his displays of late and The Wolf of Wall Street shouldn’t be any different, I’d imagine. I can’t wait to rent this! You probably already know my lamenting about missing the screening last April due to a snow storm!! Looks like a great one from McConnaughey, that guy’s definitely on a roll! McConaughey definitely is on fine form these days Ruth and this is no exception. I think this is a film that will very much appeal to you. I loved it. Considered rating it slightly higher but ill leave that for another viewing as I found some flaws to creep in, ever so slightly, toward the end. Lol. I just left a message on your post a couple of minutes ago, Ruth. Glad to hear we’re in agreement. It was very good but the denouement didn’t quite sit well with me either. It wasn’t bad but could have been a bit tighter and stayed away from becoming formulaic. I think I might know what the unanswered question was. Did it have to do with Shannon’s character while he was under the water? Nice review. Glad you enjoyed this, it’s one of my favorites of the year thus far. McConaughey is really delivering some great performances as of late. Like I’ve said to so many other commenters, so far, man. McConaughey is definitely delivering the goods just now. He has quickly become one of my favourite actors over the last year or so. Can’t wait to see his upcoming projects as well. It looks that his fine form is going to continue. Nice Review Mark, McConaughey really seems to be getting taken seriously as an actor as of late. Cheers Vinnie. He is getting taken seriously and for very good reason. Along with Ryan Gosling, I think McConaughey is one of the most exciting actors around at the moment. Spot on review Mark. McConaughey can do no wrong at the moment. Cheers Amon. I totally agree. McConaughey is on fire at the moment and its now got to the stage where most are eagerly anticipating his next move. Best film of the year so far, a terrific star turn and the kids are fantastic. I did not sweat the flaws that you saw, they are not obvious to me but maybe I will notice them when I see it again. A thorough review. Thanks again Richard. Yeah, I did find flaws here but they were minuscule in the grander scheme of things. I thoroughly enjoyed the film and, like you say, McConaughey and the two kids were outstanding. So far, it’s in my top three, after The Hunt and The Place Beyond The Pines. One of my top favorite films of the year and the highest I have rated so far. I really enjoyed Mud. Nice review. Jeff Nichols has done another great film…with Michael Shannon in it again no less. Nichols is three for three in my opinion Terrence. All of them are great. I did find a few faults with Mud but not enough to ruin the experience overall. Fantastic little movie. Thank you sir!